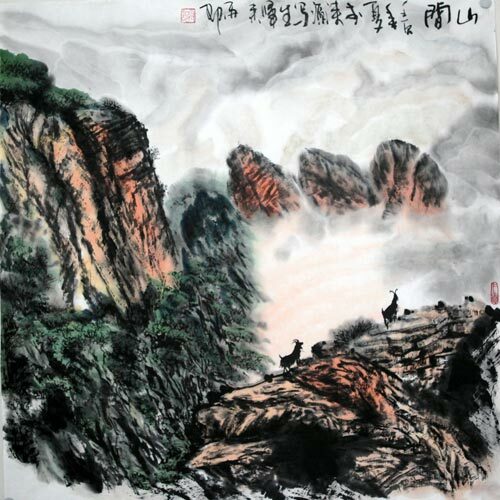 Ink wash painting, also known as literati painting is an East Asian type of brush painting that uses black ink—the same as used in East Asian calligraphy, in various concentrations. For centuries, this most prestigious form of Chinese art was practiced by highly educated scholar gentlemen or literati. Names used in the cultures concerned include: in Chinese shui–mo hua (水墨畫), in Japanese sumi-e (墨絵) or suibokuga (水墨画? ), in Korean sumukhwa (수묵화), and in Vietnamese tranh thuỷ mặc (幀水墨). Asian aesthetic writing is generally consistent in stating the goal of ink and wash painting is not simply to reproduce the appearance of the subject, but to capture its spirit. To paint a horse, the ink wash painting artist must understand its temperament better than its muscles and bones. To paint a flower, there is no need to perfectly match its petals and colors, but it is essential to convey its liveliness and fragrance. East Asian ink wash painting may be regarded as a form of expressionistic art that captures the unseen. In landscape painting the scenes depicted are typically imaginary, or very loose adaptations of actual views. Mountain landscapes are by far the most common, often evoking particular areas traditionally famous for their beauty, from which the artist may have been very distant. Water is very often included. East Asian ink wash painting has long inspired modern artists in the West. In his classic book Composition, American artist and educator Arthur Wesley Dow (1857–1922) wrote this about ink wash painting: “The painter …put upon the paper the fewest possible lines and tones; just enough to cause form, texture and effect to be felt. Every brush-touch must be full-charged with meaning, and useless detail eliminated. Put together all the good points in such a method, and you have the qualities of the highest art”. Dow’s fascination with ink wash painting not only shaped his own approach to art but also helped free many American modernists of the era, including his student Georgia O’Keeffe, from what he called a ‘story-telling‘ approach. Dow strived for harmonic compositions through three elements: line, shading, and color. He advocated practicing with East Asian brushes and ink to develop aesthetic acuity with line and shading. Ink wash painting uses tonality and shading achieved by varying the ink density, both by differential grinding of the ink stick in water and by varying the ink load and pressure within a single brushstroke. Ink wash painting artists spend years practicing basic brush strokes to refine their brush movement and ink flow. In the hand of a master, a single stroke can produce astonishing variations in tonality, from deep black to silvery gray. 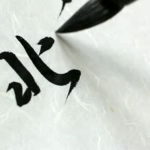 Thus, in its original context, shading means more than just dark-light arrangement: It is the basis for the beautiful nuance in tonality found in East Asian ink wash painting and brush-and-ink calligraphy. Ink wash painting is usually done on xuan paper (Chinese) or washi (Japanese paper) both of which are highly absorbent and unsized. Silk is also used in some forms of ink painting. Many types of xuan paper and washi do not lend themselves readily to a smooth wash the way watercolor paper does. Each brush stroke is visible, so any “wash” in the sense of Western style painting requires partially sized paper. Paper manufacturers today understand artists’ demands for more versatile papers and work to produce kinds that are more flexible. If one uses traditional paper, the idea of an “ink wash” refers to a wet-on-wet technique, applying black ink to paper where a lighter ink has already been applied, or by quickly manipulating watery diluted ink once it has been applied to the paper by using a very large brush. In ink wash paintings, as in calligraphy, artists usually grind inkstick over an inkstone to obtain black ink, but prepared liquid inks (墨汁 in Japanese, bokuju) are also available. Most inksticks are made of soot from pine or oil combined with animal glue. An artist puts a few drops of water on an inkstone and grinds the inkstick in a circular motion until a smooth, black ink of the desired concentration is made. Prepared liquid inks differ in viscosity, solubility, concentration, etc., but are in general more suitable for practicing Chinese calligraphy than executing paintings. Inksticks themselves are sometimes ornately decorated with landscapes or flowers in bas-relief and some are highlighted with gold. Ink wash painting brushes are similar to the brushes used for calligraphy and are traditionally made from bamboo with goat, cattle, horse, sheep, rabbit, marten, badger, deer, boar and wolf hair. The brush hairs are tapered to a fine point, a feature vital to the style of wash paintings. Different brushes have different qualities. A small wolf-hair brush that is tapered to a fine point can deliver an even thin line of ink (much like a pen). A large wool brush (one variation called the big cloud) can hold a large volume of water and ink. When the big cloud brush rains down upon the paper, it delivers a graded swath of ink encompassing myriad shades of gray to black. Once a stroke is painted, it cannot be changed or erased. This makes ink and wash painting a technically demanding art-form requiring great skill, concentration, and years of training.